Yesterday someone said to me, “I don’t know if it was sunrise or sunset, but it was beautiful”. So it goes on the R/V Lawrence M. Gould (LMG), the surrounding scenery is incredible but the work schedule on this research ship makes it difficult to remember what time of day it is. Here on the Antarctic Peninsula, the sun never really sets and our daily schedules are dependent on things like the diel vertical migration of krill, the current wind speed and the amount of sea ice in between us and our study species, the humpback whale. For these reasons, we sometimes find ourselves starting our workday at odd hours, like 11:45 pm (or 4:00 am). As a reminder, I am currently working on research vessel on a project called the Palmer long term ecological research (LTER) project. You can read my first blog post about that here. We are about one week into our journey and so far, so good! Our journey began in Punta Arenas, Chile, where we spent two days loading our research supplies onto the LMG and getting outfitted with cold weather gear. From Punta Arenas we headed south through the straights of Magellan and then across the Drake Passage. Along the way we spotted a variety of cetaceans including minke, fin, sei and humpback whales, and Commerson’s and Peale’s dolphins. I spent as much of our time in transit as I could looking for seabirds, the most numerous being white-chinned and cape petrels, southern giant petrels, and black-browed albatrosses. Spotting either a royal or a wandering albatross was always exciting. An eleven foot wingspan allows these albatross to glide effortlessly above the water and this makes for a beautiful sight! We have spent the last four days transiting between various sampling stations around Palmer deep, which is an underwater canyon just south of our home base at Palmer station. When conditions allowed, we loaded up our tagging and biopsy gear into a small boat and went to look for humpback whales. We’ve been incredibly successful with the limited amount of time we’ve had on the water and this morning we finished deploying our sixth tag. We brought a few different types of satellite tags with us to deploy on humpback whales. One type is an implantable satellite tag that transmits location data over a long period of time. These data allow us to gain a better understanding of the large-scale movement and distribution patterns of these animals. The other tag we deploy is a suction cup tag, so called because four small suction cups attach the tag to the whale. These suction cup tags are multi-sensor tags that measure location as well as fine scale underwater movement (e.g. pitch, roll, and heading). They are also equipped with forward and backward facing cameras and most importantly, radio transmitters! This allows us to recover the tags once they fall off the animal and float to the surface (after about 24 hours). The data we get from these tags will allow us to quantify fine-scale foraging behavior in terms of underwater maneuverability, prey type and the frequency, depth and time of day that feeding occurs. When we deployed each of these tags we also obtained a biopsy sample and fluke photos. Fluke photos and biopsy samples allow us to distinguish between individual animals, and the biopsy samples will also be used to study the demographics of this population through genetic analysis. Now that we’ve deployed all of our satellite tags and have recovered the suction cup tag just in the nick of time (! ), we are starting our first major transect line toward the continental shelf. We will be continuing south along these grid lines for the next week. I’ll leave you with a few of my favorite photos of the trip so far! There is nothing like a feature film about an upcoming field research project to get you pumped. I’m talking about Antarctic Edge: 70˚ South (now available on DVD, iTunes and Netflix!). In two months a few of us from the Biotelemetry and Behavioral Ecology Laboratory (BTBEL) will be headed down south to participate in the research project that is documented in this film. 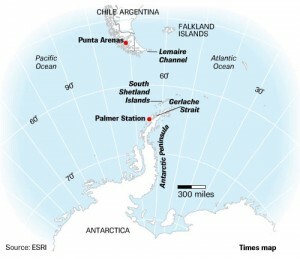 The project is called the Palmer Station Antarctica LTER. LTER stands for long term ecological research. 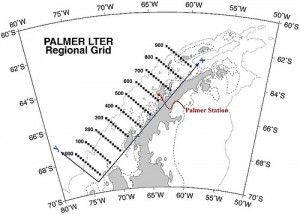 The Palmer site is located along the Western Antarctic Peninsula (WAP) and is part of a network of LTER sites around the world that have been established over the last three decades or so for the purpose of long term ecological monitoring. 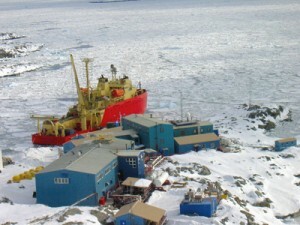 The WAP is a particularly unique place to monitor the effects of climate change because it is one of the most rapidly warming areas in the world. Temperature increases in this region are six times greater than the global average. As a result of increasing temperatures, the peninsula has experience a decline in the extent, concentration and duration of winter sea ice. After my first viewing of Antarctic Edge with its graphic scenes of calving glaciers I thought, well, that’s a little dramatic. If you watch the preview you’ll get a taste of what I’m talking about. However, in an ecosystem dependent on sea ice, the loss of three months-worth of ice a year is dramatic! The scientists leading the Palmer LTER project have watched the marine ecosystem at Palmer Station transform radically over the course of their careers. Coastal areas along the peninsula more closely resemble the warmer and moister sub-Antarctic rather than a traditionally cold and arid Antarctic climate. The most visible effect of this southward climate shift has been an expansion of sub-Antarctic, or ice-intolerant species, into areas where ice-dependent species are disappearing. Antarctic Edge attempts to convey the urgency and importance of understanding ecological changes like these. In January, a team of researchers from all over the country will board the R/V Lawrence M. Gould (LMG) and depart Punta Arenas, Chile. From Chile we’ll cross the Drake Passage and continue south to Anvers Island, where our research station is located. Personnel and research gear will be exchanged and then the LMG will transit south along a pre-established sampling grid. This grid covers the entire Western Antarctic Peninsula, an area the size of Oklahoma (69, 498 square miles). Over the course of a month we will collect samples and data on nearly every possible component of the marine ecosystem, including everything from microbes and zooplankton to cetaceans. I will be working with folks from OSU’s BTBEL lab and collaborators at Duke University to study the region’s whale populations. We will be focusing our efforts on humpback whales and we will be using methods such as photo identification, tagging and biopsy sampling to understand more about this species in this area and to learn more about the ecological roles that these large baleen whales play in this fragile marine ecosystem. We are especially interested in learning more about the foraging ecology of this species and how their behavior is influenced by their primary prey, Antarctic krill. Many of the region’s top predators share this prey resource, which is declining as a result of sea ice loss. A central objective of our research is to understand how climate induced changes in this polar marine environment are affecting these top predators. Over the next few months I’ll be keeping you updated on our preparations and journey south. Until then, I encourage you to watch Antarctic Edge: 70˚ South and get pumped!